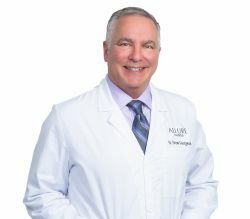 Dr. Drew Georgeson is a Board Certified General Surgeon in private practice for over 25 years. Areas of focus include advanced laparoscopic surgery, the diagnosis and treatment of breast disease which includes reconstructive and cosmetic surgery and minimally invasive venous surgery. Dr. Georgeson also has extensive experience in emergency room general surgery and trauma surgery.